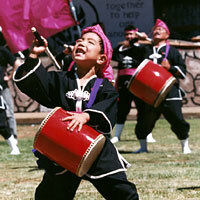 Can you guess where this young Taiko performer might get some andagi, ashitibichi, and yaki soba? If you guessed Japan, you're close! Many Japanese people (over 125,000) moved from Japan to Hawaii in search of a better life. They, along with other Asian immigrants, were often employed to work on sugar plantations. Today, there is a strong Japanese culture in Hawaii and it is celebrated with the Okinawan Festival. So, if you're eating andagi you're eating deep-fried doughnuts, if you're eating ashitibichi, you're eating pig's feet soup, and if you're eating yaki soba you're eating noodles stir-fried with vegetables and meat. These are all delicious Okinawan-style dishes that you can try at the festival held each year at Kapiolani Park in the middle of Waikiki. Along with traditional Okinawan dishes, visitors can experience all kinds of traditional Okinawan culture and arts. The festival includes a parade with a paranku procession. A paranku is a small hand-held drum used in folk performing art called eisa. Other traditional Okinawan musical instruments include the taiko (drum), sanshin (lute) and the koto (zither). Have you ever seen any of these instruments? There is also the Obon, a dance performed by large groups of men, women and children of all ages.